BEST-SELLER -- NOW IN ITS TENTH PRINTING! 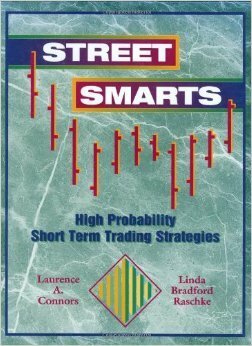 Street Smarts was selected by Technical Analysis of Stocks and Commodities magazine as one of “The Classics” for trading books written in the 20th century. "Four Out of Four Stars, Excellent!" If you trade stocks or commodities, Street Smarts is for you! Linda Raschke and Larry Connors reveal their most successful short-term trading secrets. Written by Larry Connors and New Market Wizard Linda Raschke, this 242-page manual is considered by many to be one of the best books written on trading futures. Twenty-five years of combined trading experience is divulged as you will learn 20 of their best strategies. Swing Trading - The backbone of Linda's success. Not only will you learn how to swing trade, but you will also learn specific advanced techniques never before made public. News - Among the strategies revealed is an intraday news strategy they use to exploit the herd when the 8:30 a.m. economic reports are released. This strategy will be especially appreciated by bond traders and currency traders. Pattern Recognition - You will learn some of the best short-term setup patterns available. Larry and Linda will also teach you how they combine these patterns with other strategies to identify explosive moves. ADX - In Connors and Raschke's opinion, ADX is one of the most powerful and misunderstood indicators available to traders. Now, for the first time, they reveal a handful of short-term trading strategies they use in conjunction with this terrific indicator. Volatility - You will learn how to identify markets that are about to explode and how to trade these exciting situations. Also included are chapters on trading the smart money index, trading Crabel, trading gap reversals, a special chapter on professional money management, and many other trading strategies! Chapter 9 - The "Anti"